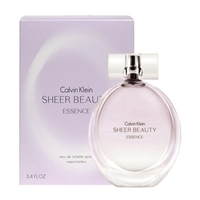 Sheer Beauty Essence opens with refreshing top notes of nashi pear blossom and white peach. a delicate blend of turkish rose petals, precious peony and magnolia envelops the heart. A dry down of sheer musks, hints of creamy vanilla and intoxicating cedarwood creates an addictive, yet weightless sensuality. Top notes: nashi pear blossom, white peach. Heart: peony, magnolia, lilac, turkish rose. Base : sheer musks, vanilla, cedarwood.